Thirty-two teams. Eighteen state championships. Zero tryouts. *Games are subject to change ... for up to date info, please check the athletic calendar on the right-hand side for complete up-to-date listings. Try it, not tryouts. 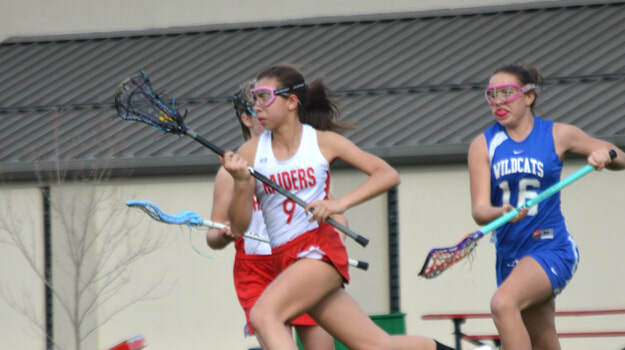 The North Cross School athletic program is based on the knowledge that a well-exercised, competitive young person can learn about himself or herself in the athletic arena in a way difficult to match in other areas of school life. The development of the complete person is the goal of both the faculty and the students at North Cross and that goal is enthusiastically pursued in our athletic program. ​We expect a lot from our students, in the classroom and on the field; and they deliver. In fact, 22% of the class of 2018 committed to playing sports at the collegiate level when the national average is just 6%. North Cross School is a charter member of both the Blue Ridge Conference (BRC) for our girls’ teams and the Virginia Independent Conference (VIC) for our boys’ teams at the JV and varsity levels. North Cross School is also a member of the Virginia Independent School Athletic Association (VISAA). VISAA is the state governing body for independent school athletics and sponsors all state playoffs for varsity sports. The program, given its small size, has quite an impressive history: 158 conference titles, and 17 state championships since it began competing in 1974. 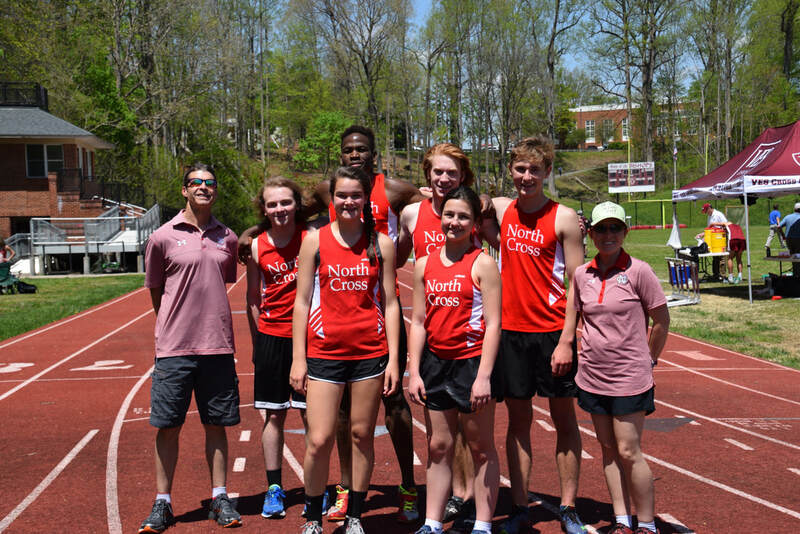 The sport of cross country has always been very popular at North Cross School, and the mountains of Roanoke offer a beautiful backdrop for distance running. 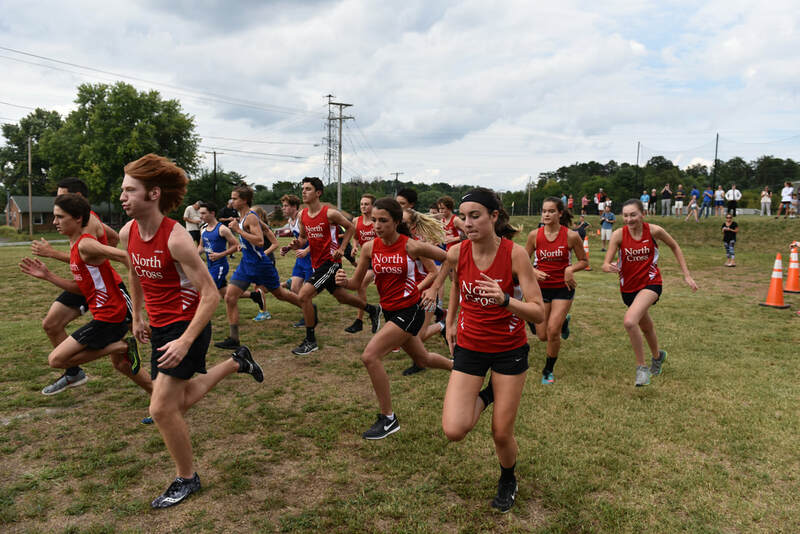 During the season, the boys’ and girls’ teams normally compete in six to eight dual meets as well as two or three large invitational meets including Knights Crossing at Green Hill Park. We compete in the VIC championship as well as the state independent school championship at Fork Union Military Academy. All of our varsity competitions take place on a 5K course, but there are also “developmental” races for younger runners which take place on shorter 1.5–2 mile courses. The teams train both on campus and in several local venues including Fishburn Park, Washington Park, and on trails along the Blue Ridge Parkway. The hilly terrain in the Roanoke Valley makes for a great variety of training, and the North Cross home course is particularly challenging with its famous “Middle School Hill” coming just after the two mile mark. The vision for the North Cross School football program is to create a winning program that prepares young men for the demands of life beyond of the realm of football. 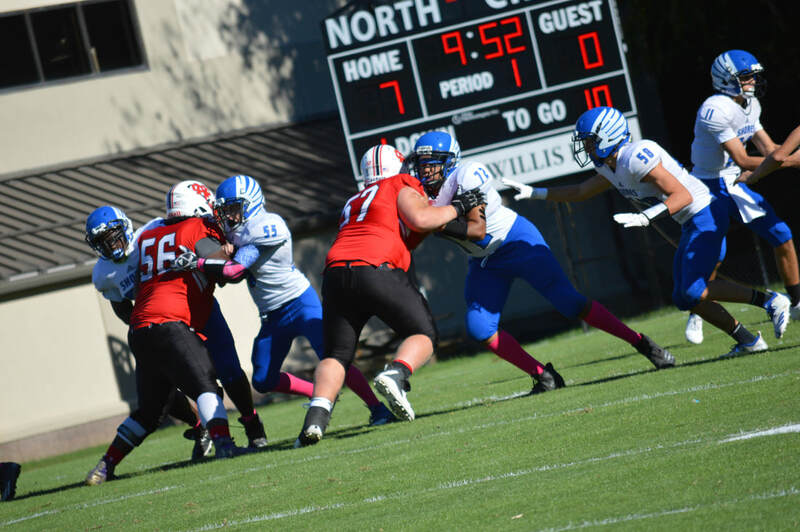 A North Cross football player should be supported athletically, academically, and emotionally in the football program. North Cross helps young people—on both our Middle and Upper School teams—reach their potential and achieve success in college and beyond. Our football program is a part of that process. A North Cross football player should be a model citizen in the school community and a model student in the classroom. On the field, the North Cross football team must be fundamentally sound, well prepared, well conditioned, and confident. Finally, along with the life lessons learned and football games won, participation in the North Cross football program must be an enjoyable and rewarding experience for all of those who brave its demands. ​The North Cross men’s soccer program was organized under the direction of Richard Cook in 1972. In his 36 years as the varsity coach, Cook compiled a 458-112-51 record, winning 18 Virginia Independent Conference championships and the 2007 VISAA state championship. Current varsity coach James Brown joined Coach Cook’s staff as an assistant in the spring of 2005. Brown, a former player at Roanoke College, assumed the head coaching responsibilities in the fall of 2008. Brown also assisted both the men’s and women’s programs for the Maroons before coming to teach and coach at North Cross. 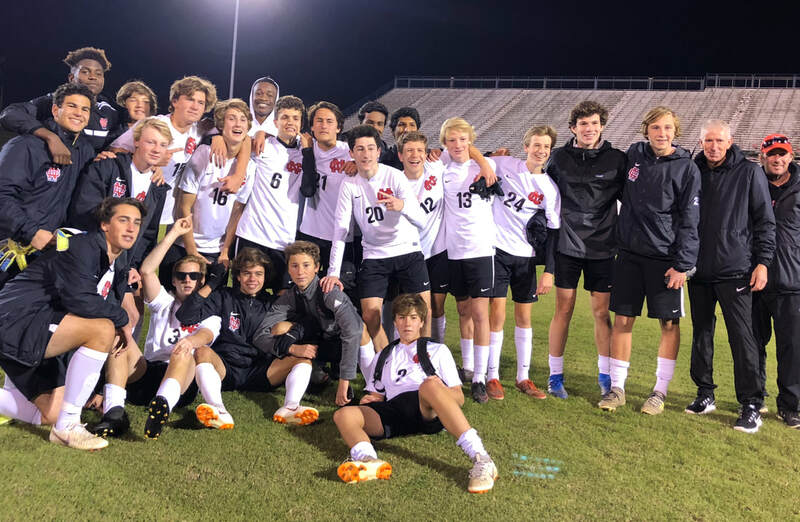 He led the Boys Varsity team to their 2018 VISAA State Championship, defeating Carlisle School 2-1. North Cross has a rich soccer tradition in the Roanoke Valley. Players are encouraged to play as much as possible and to attend camps around the state and country. Several team members have been recognized by the Roanoke Times as “Timesland Players of the Year” and additionally to the “All-Timesland Team.” The soccer program also boasts a record number of players who have played at the collegiate and professional levels after high school. The Middle School Soccer program has three priorities: to ensure that all the players have a fulfilling experience as soccer players and teammates, to ensure that all the players gain new skills and experience in order to become valuable members of the varsity squad in later years, and to gain victories on the soccer field. Practices emphasize passing and smart play, like good positioning and being vocal on the field. Respect for teammates, the coach, and officials will be stressed. Complaining, disrespect, lack of encouragement to others or failing to have a sense of humor about mistakes will not be tolerated. Hard work and pushing one's self on the field will be encouraged and praised. 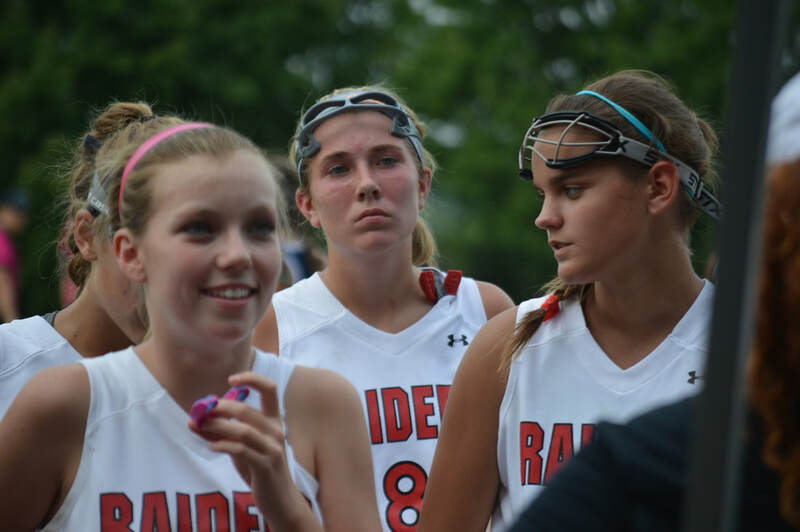 North Cross School is the only secondary school in the Roanoke Valley to offer field hockey to its upper and middle school girls. The program consists of a varsity and a junior varsity team who compete in the Blue Ridge Conference. The varsity season concludes with a conference tournament which North Cross has won six times. Additionally the teams travel to Richmond, Charlottesville, and cities in North Carolina competing against state-ranked opponents. Regardless of the challenging schedule, the athletes focus on developing hockey skills and playing together as a team. They are encouraged to attend summer camps and to play in the Virginia Commonwealth Games. Traditionally the teams are not as tall as the competition and take pride in being very tenacious, defensive teams. Passing and serving skills are stressed at all levels of competition. Focus is on “team play” and developing the ability to play as a unit. Players are encouraged to attend volleyball camps offered during the summer on the North Cross School campus or elsewhere. 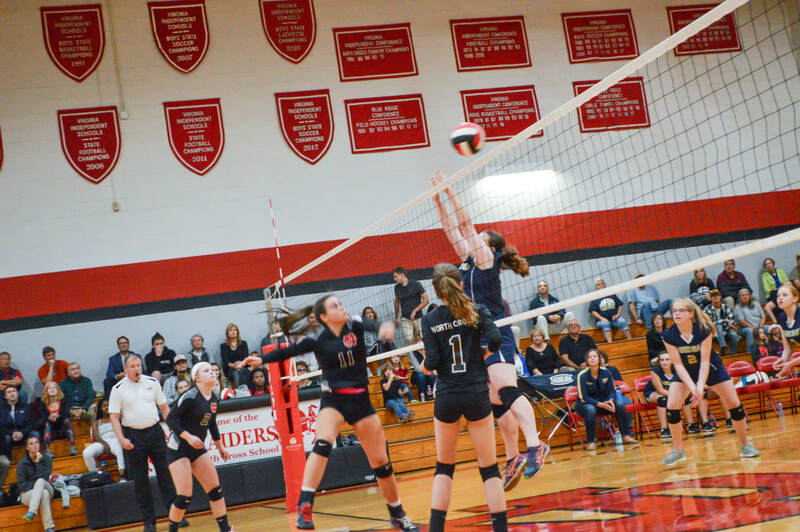 Ten schools in the Blue Ridge Conference offer multiple levels of volleyball. In addition to competition with the BRC schools, the junior varsity and varsity teams compete against several local public schools. 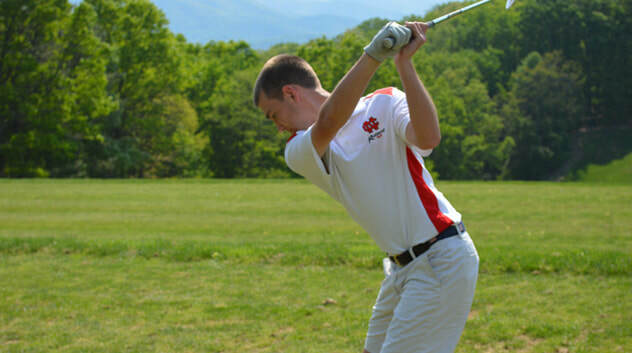 The varsity team participates in the North Cross School Invitational tournament each fall which includes, in addition to North Cross, seven independent schools from all over the Commonwealth of Virginia. In 2016 the team won their first BRC Conference since 1994. The North Cross School Girls Varsity Tennis team plays in the Fall as does the Co-Ed Middle School Tennis Team, now in its third season. 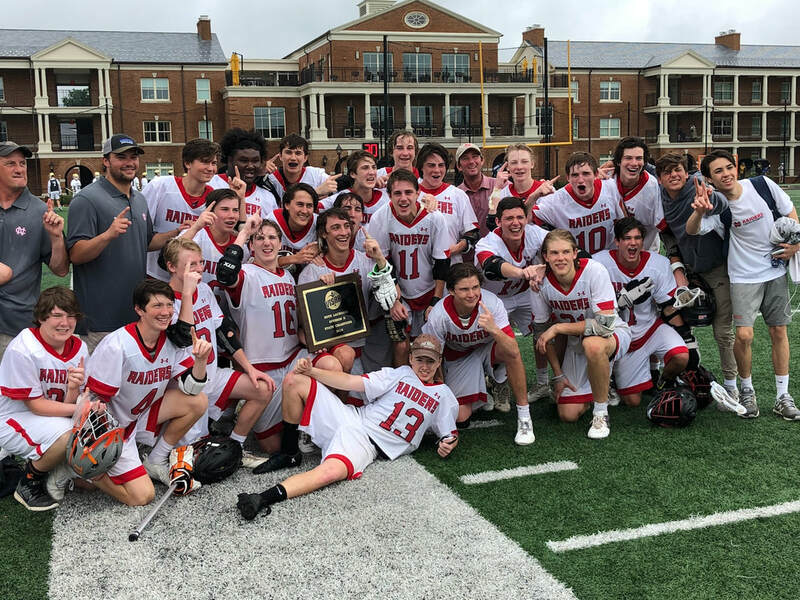 The Varsity team consistently wins the Blue Ridge Conference and were VISAA State Champions in 2016 and 2017. They play conference and non-conference matches throughout the season. Some of the non-conference matches include local public schools and private schools who play their season in the fall. Co-ed Middle School Tennis is available for students in grades six though eight. 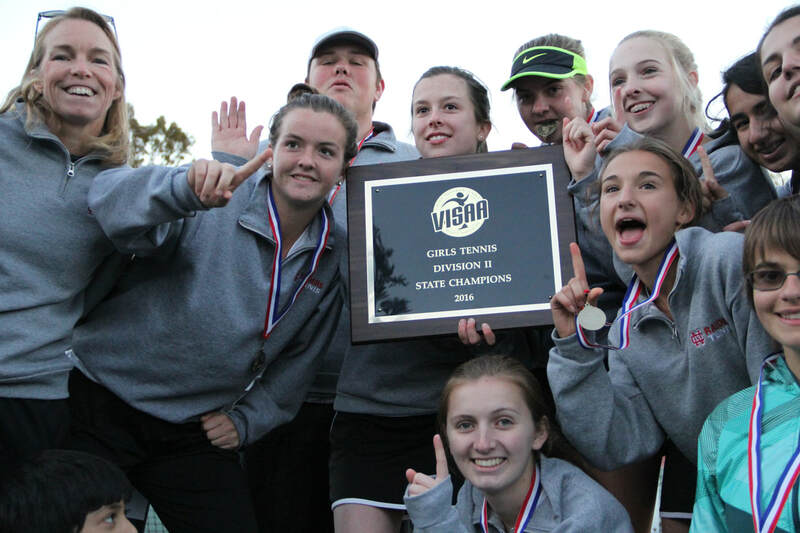 The team plays in the Roanoke Valley Tennis Association's City Middle School Tennis League and have been league champions two years running. North Cross School has four levels of boys basketball and two of girls. Coaches at each level are committed to teaching the players the importance of working hard to improve their individual skills, and all players are given the opportunity to play, regardless of their specific level of talent. 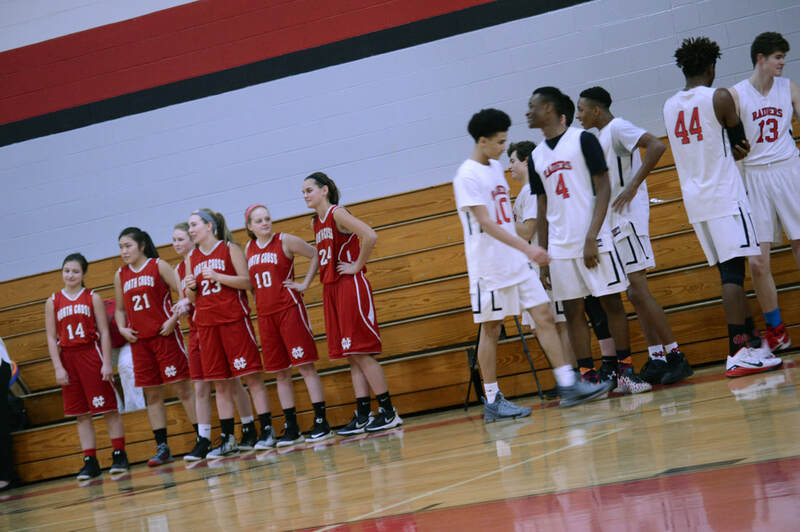 Sportsmanship is also emphasized as a integral part of being on the team. 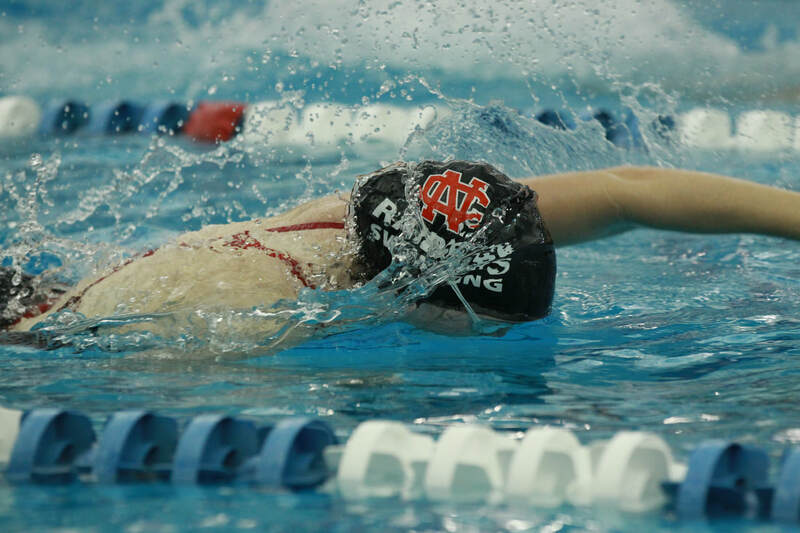 The Varsity Swim Team at North Cross has enjoyed unparalleled success winning 13 VIC Championships and six BRC Championships; the last two years the boys were the VISAA State Championship DII Runners Up, and the Girls were the 2018 BRC Champions. Many of the teams' swimmers have gone on to place in competitions at the state level—swimmers have accumulated more than 20 state titles. The team trains and competes at the Carter Athletic Center (CAC), on the North Cross School campus, in a six-lane 25-yard championship caliber swimming facility. The CAC hosts several swim meets each season against both schools in our conferences and the top public schools in the Roanoke Valley. Swimming also has a Middle School team who competes. Last year, Boys Wrestling returned to North Cross with three in number but dedicated, nonetheless. The boys were willing to wrestle in different weight classes, and use the season as a stepping stone to what hopes to be a larger team this year. Due to fluctuating interest, the team's feasibility is dependent on numbers each year. The Baseball program is dedicated to providing the student/athlete at North Cross School an opportunity for personal growth in a team atmosphere. The team competes as a consistent force among the twelve teams in the Virginia Independent Conference. The baseball program promotes a strong competitive spirit in a positive team environment. Players are drilled in the fundamentals of the game in order to achieve the highest level of high school play. The coaching staff stresses the value of developing quality individuals where strong character, honoring all aspects of the game, and maximum effort are the constant goals. Coach Eric Lawrence has been coaching since 1989. As head coach of the Raiders he has maintained a winning percentage of .700 in the Virginia Independent Conference. Dave Dickerson has been coaching since 2001 (a former second baseman at King College) and is the father of former North Cross baseball standout, Wes Dickerson. The North Cross Raiders play their home games on campus at Porterfield Ballpark. The North Cross Boys Tennis Team has a rich tradition—having won numerous Virginia Independent Conference (VIC) Championships, including a run of four straight from 2000-2003 and most recently state champions two years running in 2015 and 2016. The program is offered to students in grades eight through 12. North Cross School was one of the first four schools in the Roanoke Valley to play girls varsity soccer, and over the years has seen the popularity of soccer explode. The girls play in the Blue Ridge Conference which consists of 12 teams. Several public schools are also included in the schedule. The team was established in 1990 and since then, the team has won eight conference championships. The North Cross School girls middle school soccer team works closely with the varsity team, focusing on improving soccer skills and teamwork. All students with an interest in soccer are welcomed into the program, regardless of athletic experience or background. The North Cross School golf program aims to allow male and female students to learn and further their golf skills/game in a non-competitive environment. Students, regardless of ability level, are welcome to join the team. In the match play component of our season, the best golfers will qualify to compete against other teams. The program aims to introduce the game to students so they may enjoy the sport for a lifetime. For the first time in 2018, and without a formal track to practice on, the North Cross running program began a new chapter in their storied history. The team practices daily on campus during the week and competes against area track teams with scheduled weekend practices on tracks to refine their skills and strategy. We can't wait to see what this team has in store! Watch a video from Coach Dickenson on why track, why now?